All Logical Machines Scale Systems include our exclusive SMART Mode making set-up a snap. SMART Mode allows the Logical Controller II to automatically learn the characteristics of your product and adjust its parameters on-the-fly to maximize accuracy and speed. 3) Press the footswitch to start filling product. 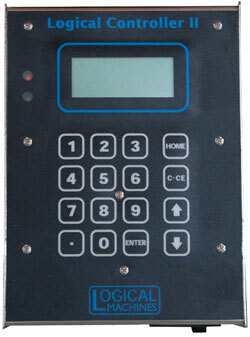 When you first use your new Scale System, the Logical Controller II will run through three cycles as it learns the characteristics of your product. In a matter of just minutes, your Scale will be filling product with no need for you to adjust, tweak, or fiddle with a single control setting. The Controller will continue to refine its accuracy and speed on-the-fly as it fills. Of course, if you like tweaking settings, you can do that too using our exclusive ROAD Software System. Either way, you'll get accurate and fast fills every time. Logical Machines is the only manufacturer in its class to offer fully automatic filling with SMART Mode.